Bose Outdoor Speakers are the ideal speakers for enjoying the best of music, video and gaming audio playback performance. 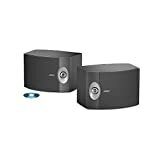 Bose outdoor speakers are among the best and favorite for outdoor music and home theatre systems. Have you at any time noticed that the sound that project from Bose outdoor speakers is dramatically different from a host of other brands? Most people today are typically obsessed with installing Bose speakers in every area of their lives. Today, wireless is the norm in the speaker space, and Bose speakers dominate our top choices—from cars to TV, even in our bathroom, outside by the pool, and right there in our golf and beach bags. It is Bose Outdoor Speakers everywhere. Here we round up a review of the Top 10 Best Outdoor Bose Speakers In 2019. Shop with our favorites and enjoy the outdoors like never before. We didn’t include the Free Space 51 Outdoor In-Ground Speakers in our reviews for fun. The speakers possess some of the best features as described below. Discreet Design: The Bose Free Space 51 In-Ground Speakers are popularly referred to as “landscape speakers” because of their design. Their stylish frame enables them to sit hidden in your garden and landscaping, but surely you will always notice them due to the quality sound they project. Sound Projection: One of the Main Selling Points of the Free Space 51 Outdoor Speaker features include an innovative radial construction which enables it to disperse sound up to 360-degree radius pattern. It produces excellent audio while reproducing low-frequency notes for an amazing musical experience. 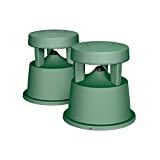 Durability: The speakers enjoy excellent protection from the rugged green shell which also allows the speakers to withstand extreme temperature ranging 40 to 150 degrees. The units are highly durable and come with base flange mounting holes for easy installations. Versatility: You can easily mount these speakers on your deck or merely put them on the ground for a convenient listening experience. Street Credibility: If you are looking for the right speakers to spice up your neighborhood party, the Bose 251 is your go-to outdoor speakers. 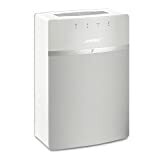 The speakers are primarily designed for outdoor partying. The excellent stereo sound is well balanced and can cover a wider outdoor area. It is perfect for beach parties. Great Sound: The sound projection from the Bose 251 Outdoor Environmental Speaker is far-reaching. It comes with multi chambers enclosure which provides low-frequency energy. The Bose 251 is the kind of outdoor speakers that can cause the deaf to hear and the dump to speak with a musical appraiser. Fit for areas such as basements and workshops. Durable & Stylish Design: Buying this speaker set means you’re buying something that will last for a very long time. Aside from the fact Bose outdoor speakers are usually durable, the 251 is exceptionally remarkable. It has a water-resistant composite casing that defies intense heat and extreme cold. White is typically beautiful and appealing, which will quickly complement your outdoor decor. Bose 301 stereo speaker brings clear and precise sound to your music and video playback. They are called bookshelf speakers because they fit easily on top of shelves or in any entertainment center. Sound Quality: The speakers provide high-quality “stereo everywhere” performance. It uses advanced technologies render life-like performance. Connect these speakers to your surround sound system, and you’re bound to experience the best audio home theatre performance. Coverage: The speakers sound helps you in extending the musical play to other rooms through its unique, extensive sound quality coverage. The stereo everywhere speaker performance produces balanced stereo sound over a wide area. Right channel speakers weigh 2.2 pounds, and right channel speakers weigh 1.8 pounds. 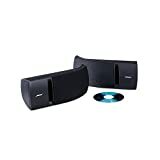 The Bose Companion 2 Series III multimedia speakers are the ideal choice for you to play your music, videos, and games in incredible fashion. The speakers render an excellent performance that far supersedes the quality of everyday models. 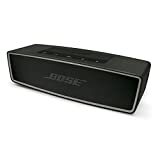 Function: Here you will experience the best of Bose exceptional sound, with excellent audio quality. The Speakers don’t just give music; it allows you to feel the performance at its best. The auxiliary input device enables you to connect and enjoy rich audio melody from other devices like your laptop, iPhone, tablet or MP3. The Bose Companion is available in two spacious unit, with commanding presence when mounted close to your computer or play system. Control: Easily adjust the volume and headphone sound using the control round button located at the front of the system. 9.45 pounds in weight measurement. Say goodbye to wires crisscrossing your home inconveniently. The SoundTouch 20 is a wireless speaker that brings intuitive access and comfortable experience to your home. 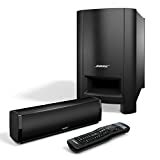 Sound Projection: Like with most other versions of the SoundTouch Wireless speakers from Bose, the 20 series III speakers are engineered to render exceptional sound that will fill your entire room. Although compact, it can drive home the difference between hearing a sound and feeling it. It is the speaker that gives you the most from your music. 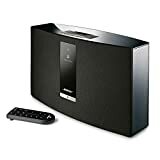 Functionality: It is interesting to know that the speaker works with your Wifi and Bluetooth devices–meaning you can play any music of your choice, including Amazon music, Pandora, Internet Radio and more. The remote control function gives you the additional option of playing, pausing, and volume control while merely sitting comfortably where you are. With Alexa, you can even play your songs from one speaker to another. Say goodbye to distorting sounds and passive-looking speakers in your home walls. The Bose 161 Remains the ideal outdoor speakers for wall mounting. Design: The Bose 161 comes in black color design, with two pairs of speakers making a unit. The speakers are versatile and usable for movies and music playback. It is best suitable for wall-mounting, and also for shelves and even on the floor. Installation: Mounting the speakers is like a work in the park. They came with wall brackets which make installing them much more easier to accomplish. Mounting them on the wall is always the best and most appealing choice. Performance: Bose speakers are known for their ultimate, balanced sound, and this isn’t an exception. They look highly fascinating on walls and sound incredibly clear over a wide area without distortions. This model includes magnetic characteristics that ultimately allows it to place close to your TV for improved audio playback. 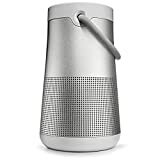 The Bose Revolve+ is the best-performing speaker from Bose’s line of outdoor speakers. Below are the qualities that make these outdoor speakers the best in its class. Sound: Are you looking for the best outdoor speakers Amazon capable of causing musical earthquakes? The Revolve+ boasts a jaw-dropping, loud and deep sound, with verifiable 360-degree coverage. The speakers are the types you can take to anywhere. They project excellent sound without clogging or buzzing off notes. Play Period: With the Revolve+, you can enjoy up to 16 hours of play time on a fully-charged lithium-ion battery. It superb Bluetooth functionality with voice prompt allows you receive calls and access Google or Siri. Two speakers pairing give you a great stereo or party mode playback. Handling: The Bose Revolove+ features a lightweight seamless aluminum body construction, alongside a flexible fabric handle design that ensures easy carriage. When you are looking for the right home theatre speakers, always consider that the Bose CineMate 15 provides you with unbeatable performance. Sound Projection: The CineMate powerful sound projection provides spacious, actionable sound complimenting a hard-hitting bass. The speakers relay clear and ultimate audio meaning to your TV’s imagery. It has excellent acoustic modules that bring movies, sports, TV shows, and gaming to reality. Functionality: Compact like a ruler yet producing wide soundstage. The CineMate 15 has four speaker array that works well with Bose TrueSpace signal processing, spreading fantastic spend far beyond the speaker’s size. It gives you the feeling that you’re inside a theatre. Universal remote control is included in this unit for effortless and smooth operation. One cable connection makes this speaker easier to use, and it doesn’t require extensive space for installation. Here is the smallest wireless speaker from Bose, which delivers rich, full sound. The SoundTouch 10 simply the act of streaming music comfortably and enjoyable. Functionality: SoudTouch 10 allows you to build multi-room wireless speakers through your home, f.rom room to room with amazing ease. You can use this speaker to stream music in one room while playing a podcast in another room. Power source preset and the on-device interface is incredibly intuitive to operate. There are four subtle LED indicators for Wifi, Bluetooth, SoundTouch status and Aux. Sound projection: Is entirely reliable and useful for small rooms. The sound is big and will fit well in your vehicle, on your camping ground, and in the field while enjoying your picnic. The MinI II is, by far, the best and highest selling outdoor speakers from Bose. Although the SoundLink Mini II shares some common features with some of Bose’s best outdoor speakers, it is remarkably different from the rest regarding some quality aspects. Sound & Handling: The system delivers full sound with amazingly deeper lows far more than anything you would have to comprehend from such a compact unit. As one would have expected from a wireless item, the SoundLink Mini 11 is highly portable, and will comfortably fit a backpack, a bag, and even your coat’s pocket. It allows you to take the sound to anywhere of your choosing. Additional Features: Another great aspect of the SoundLink Mini ll lies in the fact that you can easily pair the speakers with your Smartphone, tablets or other Bluetooth devices for more regular action. Easy charging of the unit with USB connection is another added quality to the Mini II. When fully charged, the speaker can last up to 10 hours of non-stop play. It is available in different colors, and its frame design can be customized and mount anywhere. Bose is a household name when it comes to outdoor speakers. To enjoy the very best of music, video and game playback, you need one of these speakers. 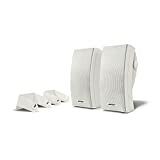 Our reviews of the Top 10 Best Bose Outdoor Speakers In 2019 provide you with all the tips you need to get the best speakers for your need. Choose yours and enjoy the best audio performance.